It seemed like such a simple idea. Ed and I had decided to rent a canoe and spend a couple of hours on the lazy Clarion River with Lily and Emmy. 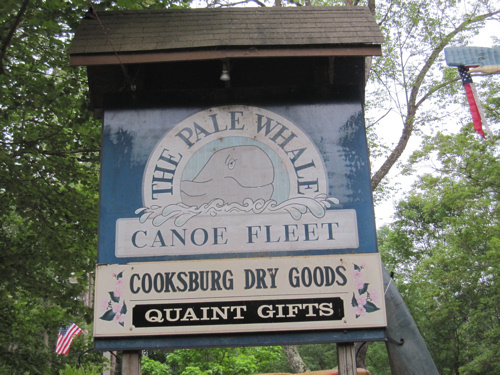 Our excitement rose as the van driver took us to the canoe launch. The girls had their life jackets on and sat in the middle of the canoe as Ed and I pushed it in the water. The day was hot and hazy, but a cool breeze floated along the water. Ed and I hopped in, ready to enjoy the next 4 miles on the river. Then the canoe wobbled, got stuck on the rocks, and Emmy burst into tears. We tried to console her as Ed hopped out of the canoe to push us off the rocks. But she wasn’t hearing any of us tell her it was okay. It was the middle of July, and so the depth of the water was not very deep. It had never even occured to Ed and me that the wobbly, tippy feeling of a canoe would terrify our youngest daughter so much. She had a death grip on the bar in front of her, knuckles turning white, tears flowing down her cheeks. Lily, of course, loved every minute. We got stuck a few more times in the shallow parts of the river, and as Emmy got used to the feeling of the canoe and Ed and I managed to start avoiding some of the bigger rocks, she even started to enjoy our adventure. Emmy was NOT going to let go of that metal bar in front of her, however. She was very relieved when our canoe ride was over and she was back on solid ground. I think we may be able to convince her to ride another canoe next summer. 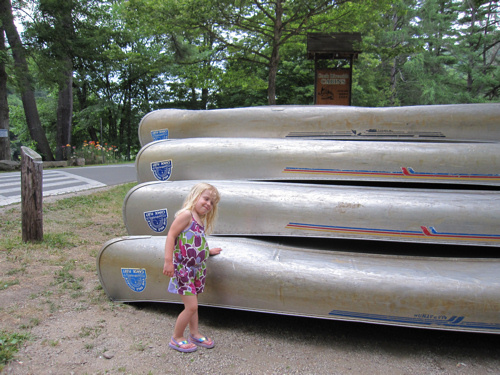 Emmy makes peace with those wibbly wobbly canoes. That was a big "Oops!" You can't avoid getting your stuff wet in a canoe! Glad she started to enjoy it. It reminds of the fact that we can love them so much yet we can not control their feelings. Guide them, love them and let them fly! I think I'd throw up in a canoe…makes me nervous. I'm sure I'd go straight into the water, head first! Oh, I remember the first time I was in a canoe: I tipped over! So, I can relate to Emmy's feelings.